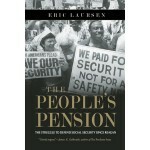 Laursen, THE PEOPLE’S PENSION; Palast, BILLIONAIRES AND BALLOT BANDITS. Eric Laursen, THE PEOPLE’S PENSION & Greg Palast, BILLIONAIRES AND BALLOT BANDITS. Eric Laursen talks about the war on social security. His book is THE PEOPLE’S PENSION. 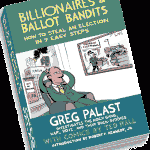 [AK Press, 2012] And Greg Palast counts up nine ways Republicans are suppressing the vote — and why it matters. His book is BILLIONAIRES AND BALLOT BANDITS. Eric Laursen When Mitt Romney heaped scorn on the 47% who depend on the government but don’t pay income tax, some of those he was talking about are the millions of seniors on social security. Romney and his running mate Paul Ryan want to put limits on Social Security and privatize it, something Wall Street is licking its chops at. (They also want to cut FEMA and disaster relief — something to ponder in the wake of Hurricane Sandy.) Regrettably, attacking social security is bipartisan — under the cloak of saving the system, both centrist Democrats and Republicans talk about slashing benefits or raising the retirement age. But financial journalist Eric Laursen says Social Security is solvent for many decades to come — and we don’t need to slash benefits or raise retirement in order to put it on an even stronger foundation. Why its under attack and what to do about it is the subject of his fascinating and important book, THE PEOPLE’S PENSION: The Struggle to Defend Social Security Since Reagan. 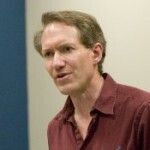 Eric Laursen is an independent financial and political journalist and activist. In addition to The People’s Pension, he the co-author of Understanding the Crash. His work has appeared in The Huffington Post, The Nation and The Village Voice, among others. The Presidential election is nearing, and the candidates are running neck and neck. A few thousand votes could decide the outcome. But fears are mounting that hundreds of thousands of voters — mostly poor, minority voters, students and the elderly, will find their votes blocked by voter suppression efforts.